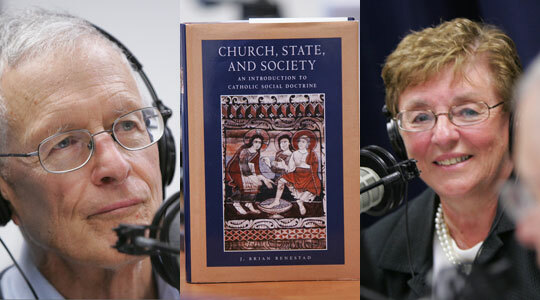 Summary of today’s show: Brian and Janet Benestad discuss with Scot Catholic social doctrine, being a Catholic in the public square, and how to establish a hierarchy among the various elements of Catholic social teaching. 1st segment: Scot began by asking what the Church asks of us in the public square, how do we form our consciences, and how do we apply Church teaching to the public square? This will be addressed today by our guests, Brian and Janet Benestad. Scot began by noting today’s news that Archbishop Charles Chaput of Denver has been appointed to become archbishop of Philadelphia. Janet said this is big news. He has been recognized nationally for his leadership in Denver. Scot said Archbishop Chaput has written two books on applying our faith to public life. Brian said Chaput is not afraid to teach the counter-cultural aspects of the Catholic faith today. Chaput was a classmate of Cardinal Seán in seminary. They are both Capuchins, studied together, and were ordained on the same day. They were both appointed as bishops at a young age. People have been drawing comparisons between the two. Cardinal Seán was appointed to Boston in its darkest days and Philadelphia is going through similar difficulties today. The archbishop’s installation will be on September 8, 2011 in Philadelphia. 2nd segment: Janet said she and Brian will celebrate their 40th wedding anniversary on September 11. Of course, their 30th anniversary was 9/11/2001 and they were traveling in Europe at the time. They have four children, 3 of them in New England. Two of them are married. They have 4 grandchildren ranging in age from 1 to 7. Their unmarried daughter lives in Rhode Island and teaches at Portsmouth Abbey. Their unmarried son is an Air Force lawyer who recently returned from Iraq. Brian has been a professor of theology at University of Scranton since 1976. In addition to “Church, State, and Society,” he’s written extensively on Catholic social teaching and bioethics. When they lived in Scranton, Janet started as a parish CCD teacher. In the 1980s, she taught political science, philosophy and history as an adjunct professor. Later, she was hired by the Diocese of Scranton and worked there for 10 years in the area of parish life, which is similar to her work in Boston in faith formation and evangelization. She’s been in Boston for a little more than two years. Boston is a much bigger place and very challenging, while very rewarding. Her areas of coverage are much larger as well: healthcare, cultural diversity, and more. Brian and Janet have also taught together at the Master of Arts in Ministry program at St. John Seminary, teaching the Catechetical Certificate. They began when they were first married teaching catechetics at St. Theresa in West Roxbury and after they moved to Scranton, Brian still had Janet’s assistance and input on his work. Brian said it’s a great gift to teach theology at the university. He would continue to do it even if he were financially independent. Practically all of his work is with undergraduates. He’s been on sabbatical this year, finishing up the work for the book. Scot said he was surprised that there weren’t many books on the totality of Catholic social doctrine outside of the Compendium of the Social Doctrine of the Church . He wanted to help people understand what the Church means by justice. For example, social justice is a new term in the 20th century. People are still trying to figure out what it means. Scot asked the difference between Catholic social doctrine and what is commonly referred to as social justice. Brian said social justice is commonly understood as a set of structures that enable society to pursue the common good. It’s not understood as a personal virtue. That’s very different from Catholic social tradition which sees justice as a virtue. Social justice is meant to in the same way that St. Thomas Aquinas called communicative justice, which is the virtue that directs all the other virtues. Social justice is all those things that contribute to the common good and meeting people’s needs. Catholic social doctrine is based on the dignity of the human person. All else is understood in relation to that. Common good is the sum of all the conditions that enable people or groups to achieve perfection, to achieve your dignity. Dignity is acquired by the way you live. People can act beneath their dignity or in accord with their dignity. If society really supports a marriage and family life, then it helps people realize they need to live a certain way to achieve their dignity. Scot said the lists seems to be prioritized. Sacredness of life and dignity of the human person is most important. Some Catholics would advocate that they’re all equal so if someone is not supporting the dignity of the human person but supporting the rest, you’re doing well, but Pope John Paul II and Pope Benedict XVI would disagree. Brian said you can never act against the dignity of the human person. Janet said if we don’t recognize the dignity of the human person and their life, then all the rest is irrelevant. The common good depends on all seven, but there might be some play in how to achieve them, but the protection of life can only be achieved in certain narrow ways and violation of that is always wrong. Brian said since 1973, and the Roe v. Wade decision, Catholic politicians have been saying that all of these are equal and if you get 5 out of 7 then you’re doing okay. Scot surmised that the paragraph itself is written in a prioritized order as well: abortion, euthanasia, cloning, embryonic stem cell research, and then the death penalty. Janet said the bishops have been clear that abortion is preeminent. The bishops have said that if a politician takes a position contrary to the Church’s teaching, the bishop will approach him, talk with him, ask him to be in conformity with the Church, and if they still refuse, to refrain from receiving Communion. Pope Benedict XVI, when he was Cardinal Ratzinger, laid out how a Catholic should approach a political candidate who supports abortion. The voter could only vote for a pro-abortion candidate if there was a proportionate reason, but nowhere have the bishops laid out what such a proportionate reason is. Voting for a politician because of his pro-abortion stance would be material cooperation with evil, while voting for a pro-abortion politician in spite of his stance on abortion because he had another stance that would prevent evil, would be remote material cooperation, which means it doesn’t take away all the evil of the situation, but reduces some of the culpability for it. Janet said we become responsible when the politician begins to pass laws that will affect society. 4th segment: Scot said Catholic social teaching is not based on bishops deciding on the Church’s political positions in the public square. Brian said the commitment to the Catholic social teaching is rooted in and strengthened by our spiritual lives. It is based on the Deposit of the Faith received from Christ and the Apostles. Scot said we’re called to know our faiths and not just listen to various pundits who say one thing or another. We’re also facing an increasing demand that the public square should only be influenced by non-faith-related values. We’re called to live as practical atheists, not letting our consciences formed by our faith influence us. Brian said this is a country that has always protected religious freedom and we can apply our faith to public issues. We don’t impose our views on others. We propose an idea. We make an argument and people don’t have to accept it. Janet said we should never be afraid of being excluded from public life for expressing our views. Nobody tells us we can’t express our religious views when we say we should take care of the poor. So we have to say that protecting life isn’t just our religious belief; it’s the truth. Part of our responsibility for being good citizens is being good parents and good teachers and to share the love of Christ. Brian also recommends reading the papal social encyclicals, the documents of Vatican II, and the writings of Aquinas and Augustine on justice.